Do you “slurp” your oysters? I remember Dad doing that with oysters straight out of the container or sometimes on a cracker. Then he introduced Bill to it. 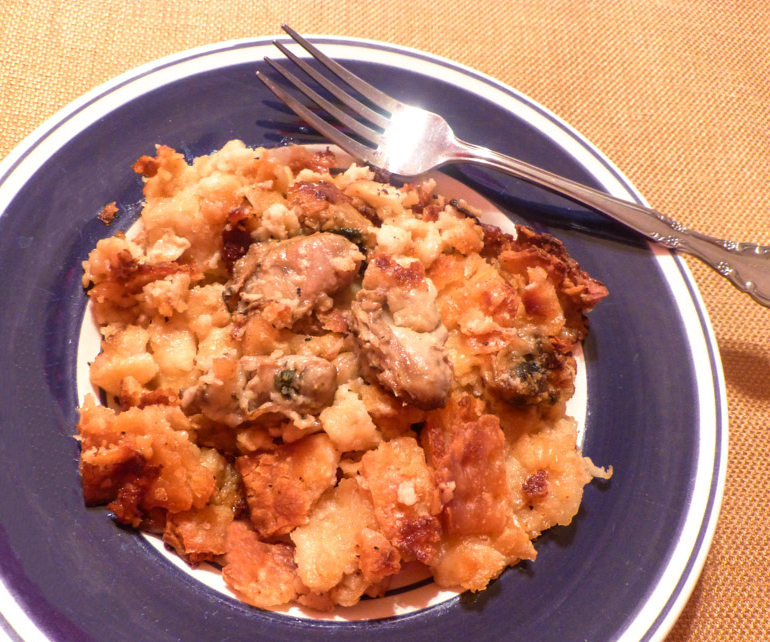 You may remember, I made Mom’s oyster “dressing” for Thanksgiving. The next evening, we feasted on a dinner of pan-fried oysters before Bill could eat them all raw. I prefer them dredged with cornmeal or crackermeal but this time I just used flour; Bill’s favorite. The oysters fried in just a couple of minutes ~ crispy on the outside and just barely cooked on the inside. I doused them with plenty of hot sauce but, they would’ve really been great piled high on a hoagie roll for an Oyster Po’ Boy! It would be fabulous to live along the Chesapeake Bay, and then we could enjoy fresh oysters in their shell. Living here, I’m sure if we fed our craving, we would be broke by now! Combine flour and Old Bay Seasoning and pepper. Dredge oysters and fry a few at a time until golden. Drain. Nothing beats hot homemade bread ~ it’s just my opinion. Baking your own bread may be a bit “old fashioned” but it is one of the most therapeutic, rewarding things I can think of. There is a wonderful feeling when you can admire the bread you made coming out of the oven and saying, “I made this all by myself.” What a feeling! I’ve baked a lot of bread over the years but lately, I have been experimenting with making dinner rolls. Bill especially loves Parker House rolls so that is the one I’ve had my trials with. Some did not rise well; another yielded a one-bite roll, with another rising to the point that I thought the oven door would pop open just like it did for Lucy. She has a great recipe for Parker House Rolls that I have made twice. The dough rose well but what I found unique was that it did not require kneading after rising. I don’t believe I’ve ever made yeast bread that was not kneaded for 10 or so minutes. It did take a long time to rise though, 2 and one-half hours. The first time I made these, I thought they were a little large after baking. This time, I cut an extra row for smaller rolls. Over-all, it is an easy recipe that just requires time and I will definitely be making them again! These buttery pull-apart Parker House Rolls are perfect for Thanksgiving dinner! A hot roll from the oven, a pat of butter ~ now that’s some kind of love! Here’s wishing you all a Happy Safe Blessed Thanksgiving! Are you filled with joy when you hear the squishy sound of the jellied cranberry sauce oozing its way out of the can and then seeing all the ridges? Or are you a victim of the canned whole berry sauce? It’s the endless thing here, some insist upon the whole berry and for others, only the sauce will do. I have to please them all and end up serving both varieties as I can’t imagine the turmoil if I didn’t. However; the fact is, the essential cranberry dish is the simplest of Thanksgiving dishes to prepare. I like to spike them with some heat, so I fused the traditional cranberry sauce with hot jalapeno jelly, crushed red pepper flakes and a couple of cinnamon sticks. It’s easy and delicious! And then, the next day ~ topping off my turkey sandwich with a little of this fiery cranberry sauce. Ummmm! Good! 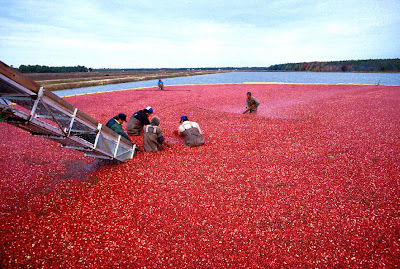 Place cranberries in colander and rinse. Bring water and sugar to a boil in saucepan. When cranberries pop remove from heat immediately. So do you go for the canned or are you a fresh cranberry person? Growing up, this was our favorite dish that Mom made every Thanksgiving and Christmas. Years later, hands down, it's the favorite dish for my family on the table at Thanksgiving and Christmas. This is a great recipe for all you oyster lovers, which I thought deserved to be posted again ~ it's that good! It's a simple recipe --- the briny oysters are layered with butter, half and half and crumbled crackers. Do not skimp on the ingredients; use real butter, half and half and a rich butter cracker. Do not crush the crackers into dust; crumble them into bite-size chunks. Use less crackers for a crisper dish. This dish has an addicting oyster taste that makes it a special side dish. Serve it bubbly hot and it will be a requisite on your holiday table also. Talk about savory and delectable, this is it! Let the drooling begin, Bubba! I know it’s your favorite dish on the table! Bake in 375 degree oven till bubbly and top is brown, about 30-45 minutes. Years ago, a woman at work told me that her grade school daughter ate cold pizza for breakfast that morning. I’m guessing she was waiting for me to be aghast but I told her that was probably better for her than some of the cereals, etc. out there. Last month, this pizza by the sugar queen got my attention and it is a true breakfast pizza. I actually made it for dinner the other evening instead of breakfast. It’s simple and good, a little rich with the crescent rolls. Bill gave it rave reviews and so did I. I used cooked crumbled bulk pork sausage and lots of Co-Jack. Thanks Sugar Queen! It was delicious! Generously grease a 9 x 13" pan and lay the crescent rolls flat, pressing the seams together. Layer on the sausages, and then the cheese. Beat together the eggs, milk, salt and pepper. Pour over all and bake 425 degrees for 20 - 25 minutes, or until cooked through and cheese is melted and browned. Do not overbake. *This would be good with a bulk Italian sausage, browned. You can use any sausage you want, really. It would be perfect for breakfast/brunch over the holidays! 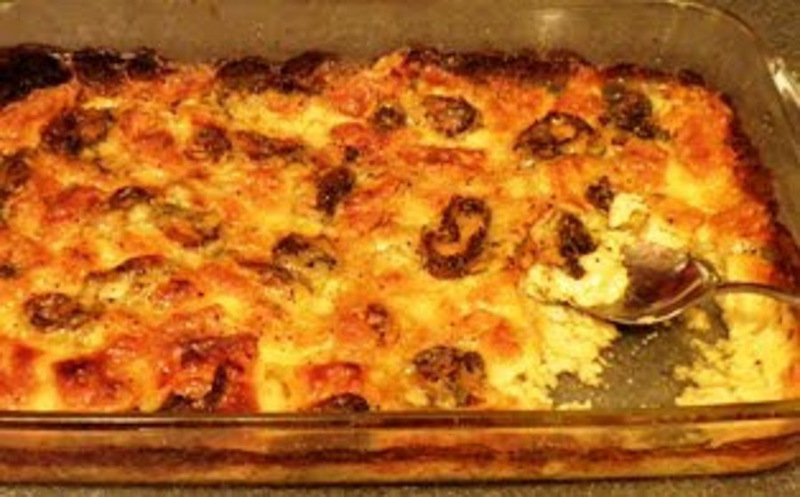 The recipe is from a chef friend and is a re-post from when I first started this blog ~ I want to share it again as it is the absolute best stuffing that my family and I love. It has honors as our traditional stuffing. 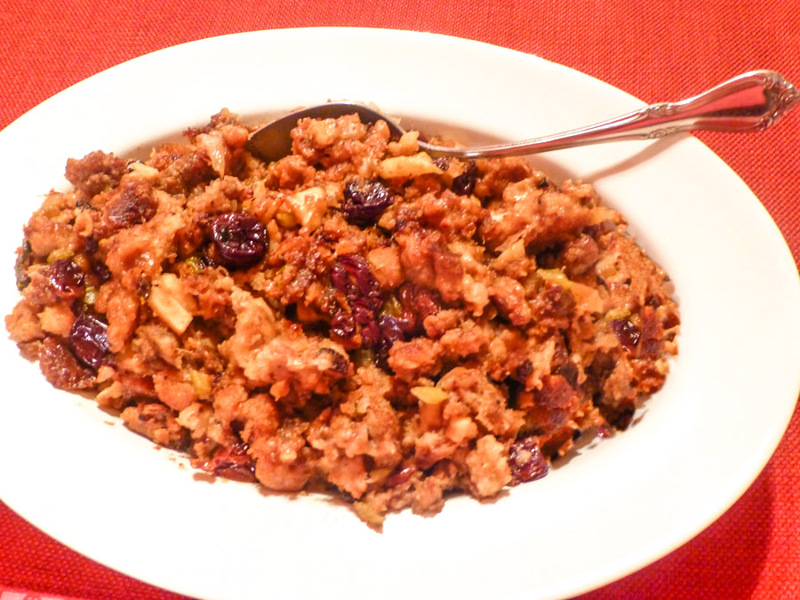 By adding Italian sausage, apples, pecans and Triple Sec, it is a moist and flavorful stuffing ~ distinctive from all others. Just one bite of this delicious stuffing will be enough for a chorus of “aahs” around the dinner table – it’s that good! Give it a try and it could be your traditional stuffing! In a large skillet, melt ½ c. butter over medium heat. Using the same skillet, cook the sausage until crumbled and brown. Drain. Mix in melted butter, water, ½ cup orange liqueur. Butter a 15x10” baking dish well. Place stuffing in prepared dish. It is incredibly delicious, the ultimate stuffing! Just one bite of this delicious stuffing will be enough for a chorus of “aahs” around the dinner table --- it’s that good! This is a great way to dress up butternut squash! I love stuffing, especially during the holidays this time of year. This recipe is not the stuffing I make to stuff the turkey ~ I’ll post that next week. However, this could be increased and would work fine for Thanksgiving dinner as a turkey stuffing or as a vegetarian entrée with the squash. This is a simple side dish that is filled with good dried cranberries and raisins, fresh sage and parsley, along with pecans and crumbled cornbread. You can make the cornbread a couple of days ahead of time or even buy it at the market. Then combine all the ingredients, fill the squash and bake. It’s delicious and a perfect match for acorn or butternut squash. Brush cut sides with 1 tablespoon olive oil. Soak dried fruit in hot water 10 minutes. Drain and discard liquid. Set aside. Heat remaining oil in a medium skillet over medium-high heat. Add onion and garlic, sauté 5 minutes. Combine remaining ingredients with onion mixture. Place cornbread stuffing into each squash half. Return squash to oven and bake about 20 minutes, until stuffing is well heated and golden brown on top. Makes about 2½ cups stuffing. It was the 11th hour of the 11th day of the 11th month in 1918 when hostilities ceased between Germany and the Allied nations. November 11 became Armistice Day that recognized the end of World War I, the “war to end all wars,” and later evolved into Veterans Day. 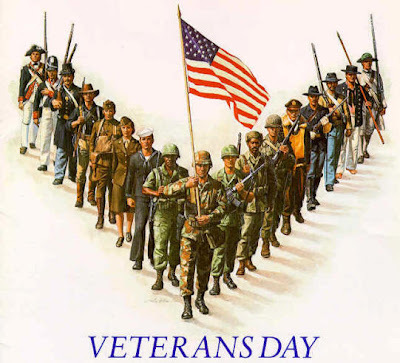 Veterans Day honors ALL American veterans, both living and dead. Actually, Veterans Day is mainly intended to thank the LIVING veterans for loyal and dedicated service to their country. On this day, November 11, of every year we ensure veterans know that we deeply appreciate the sacrifices they have made to keep our country free. Please remember, if you cherish your rights, thank a veteran, the ones who sacrificed and continue to sacrifice. I am thanking my favorite veteran, my dear husband Bill, who proudly served in the United States Army from 1965-1968 and all of you fellow veterans also! God Bless our troops ~ past and present. This recipe is from Baked: New Frontiers in Baking by Matt Lewis and Renato Poliafito. Someone mentioned the cookbook on his/her blog and made a recipe from it. Of course, I thought I bookmarked it, but didn’t, and now I don’t know whose blog it was. Whatever recipe you made, it really got my attention! WAS IT YOURS??? Nevertheless, this cookbook has lots of great treats in it! There are some amazing recipes for cookies that I will be trying as well as the recipe for “Sweet and Salty Cake.” It looks chocolaty delicious! And a Milk Chocolate Malt Ball Cake also. Most folks like the tangy taste of lemon and these scones definitely have it. They are not sweet at all and that is what I like about them. Matt, my younger son, was sampling the scones when he commented, “They have a unique taste, but I’m not sure what it is.” I’m not sure either; if it is due to the ginger with the lemon, or the raw sugar on top, or the combination of all three. I sprinkled raw sugar on top of the scones before baking --- does it have a very distinct taste after baking? It was hard to tell since it was embedded in the scones. Instead of grating lemons, I used McCormick’s lemon peel as I could not find a bottle of lemon zest in the market. Is lemon peel stronger than lemon zest, are they interchangeable? I should’ve used real lemons, right? Do lemon and ginger combine well? I don’t recall ever having a problem with that duo. In a large bowl, combine the flour, sugar, baking powder, baking soda, salt and ginger. In a separate bowl, whisk together the egg, ¾ cup of the buttermilk, and lemon zest. Slowly pour the wet ingredients into the dry ingredients, and then gently knead the dough with your hands until the dough starts to come together. Move the dough to a lightly floured surface. Use you hands to shape the dough into two discs (about 1½ inches in height.) Do not overwork the dough. Place the wedges onto the prepared baking sheet. Brush each scone with the remaining buttermilk and sprinkle with raw sugar. Bake in the center of the oven for about 25 to 30 minutes (rotating the baking sheet halfway through the baking time) or until the scones are golden brown. It’s another great cookbook for treats! Thanks so much to all of you who participated in my Blogoversary contest for My New Orleans: The Cookbook by John Besh! I thoroughly enjoyed reading your comments. Like I said earlier it has been fantastic 'meeting' all of you great people out there and I am looking forward to another year of blogging with you. Congratulations again Design Dine and Wine! Please contact me at mzpst@att.net and this super cookbook will be yours. Growing up, I loved it when Mom cooked a beef chuck roast because I knew there would be beef salad sandwiches to follow. I don't know where she got the idea of doing this with left-over roast beef, but I'm glad she did! Mom used an old-fashioned shiny clamp-on galvanized meat grinder, and I did also for many years. It is a great tool for grinding meat, vegetables, nuts and fruit that is cheap also. If you’ve never used one, the first thing that will get your attention is the weight of it, about 5 pounds. It’s unbreakable and durable. The handle attaches to the grinder with a nut; the ‘worm’ is the spiraled part of the grinder that moves the food to be ground through the body. Attaching either the coarse or fine plate and then the screw ring gives you a perfect tool for grinding meat and so forth. The main thing of concern was that the clamp at the bottom holding the grinder to the counter or table was very tight. If not, it started sliding and could fall right off the table. In reality, this is the best tool for grinding meat and all perfectly! Go ahead many years and the food processor became king. It certainly does a great quick job of chopping but it does not provide quite the texture that the grinder with the ‘worm’ gives. So be sure if you use a food processor to chop and pulse in 1 to 2 second bursts until the desired fine consistency is met. Just a few ingredients; such as, Miracle Whip (mayonnaise? ), pickle relish, eggs and onions to make a great sandwich. I have to say, Bill thinks this beef salad sandwich is par with a tuna, chicken or ham salad sandwich any day! Grind the meat in food processor using chop and pulse mode, pulsing in 1-2 second bursts. Remove to a bowl and add remaining ingredients. Assemble a sandwich using your favorite bread. 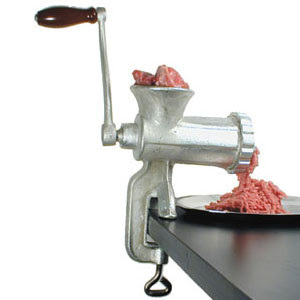 Do any of you use the old-fashioned meat grinder? Today is the last day to enter my giveaway for Chef John Besh’s “My New Orleans” cookbook that was posted on October 29, 2010! Beef & Potatoes with Rosemary and It’s a Small World! A couple of months ago, Valerie sent me an email introducing herself and telling me she was a new follower of my blog. She explained that she stumbled over my blog while surfing the net and that she is from Reynoldsburg, Ohio and now lives in Louisville, Ky. I thought “Wow!” Reynoldsburg is the next town over from where our farm was located in Pickerington. I later then moved to Louisville, KY. What a coincidence! We both lived in the same area in Ohio and then we both moved to Louisville. I emailed her back and told her exactly where our farm was and my grandfather’s farm with their farm house just down the road from us. I explained that it has all changed so much now. Both farm houses are still there but there is a funeral home and a bank across the street from my grandparent’s house and a church by our house now. Plus it is all built up with houses and stores now ~ not all fields as when we lived there. She emailed back and said the house has an in-ground pool and is across from the funeral home and church with a shop near the house. I told her yes, that was my grandparent’s house. They built it many years ago and the pool was installed much later by Uncle Jake and Aunt Phyllis. Her next email told me that her aunt bought my grandparent’s house years ago and the shop next door is her embroidery shop. Her aunt lives in my grandparent’s house! She said her aunt loved the old wallpaper in the dining room so much that it’s still there. Like she said, WOW! This is just too weird! This proves it is a small world in blogger land. I’m so glad to have met Valerie and to see photos of the area as it looks now. Valerie has a great blog in which she talks about her life in Louisville with her husband and 3 cute kids. This is Valerie’s recipe for pot roast @In His Image. You may recall I just bought a slow cooker after many years of not having one and this is a perfect recipe for it! It all turned out beautifully. Cooked to perfection! Bill really likes it when I make pot roast so check back next week to see what he does with it! Yum! This a great pot roast recipe w/ a bit of a twist. The Dijon mustard just makes it so different from your everyday roast. Arrange the potatoes & carrots around the edge of your slow cooker. Mix mustard, rosemary, thyme, S&P, and spread evenly over the roast. Place beef in cooker, sprinkle onion on top, & pour in beef broth. Cover & cook 6-8 hours. Thanks so much Valerie for the great memories and the recipe also! Be sure to enter my giveaway for Chef John Besh’s “My New Orleans” cookbook that was posted on October 29, 2010!